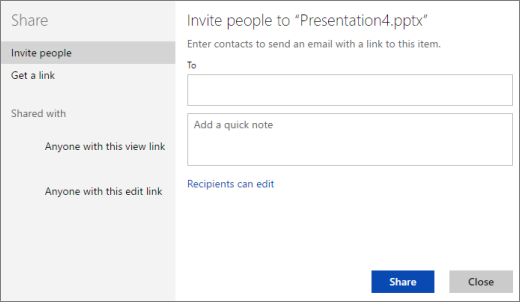 Any presentation stored in OneDrive or SharePoint Online can be worked on by multiple editors in PowerPoint Online. You can add comments and edit independently or simultaneously. To get the right instructions, in the list below, choose where your presentation file is stored. Where is your presentation stored? In PowerPoint Online, click the Share button. Under Share, choose one of the following. To give others read-only access to your presentation, click Recipients can edit, and then choose Recipients can only view. 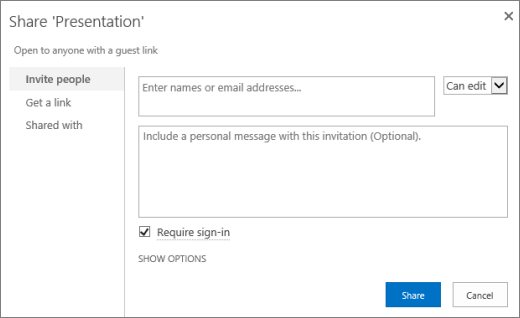 To require recipients to have a Microsoft account to view your presentation, click Recipients can edit, and then choose Recipients need to sign in with a Microsoft account. Enter the email addresses of your recipients in the To box, and click Share to send the email invitation. To specify editing or read-only access to your presentation, choose either Edit or View only from the list. To create and copy your link, click Create link. To give others editing or read-only access to your presentation, click the down arrow and choose either Can edit or Can view. Click Share to send the email invitation. To specify access restrictions, choose a sign-in option from the list. To copy your link, click Copy. To change the expiration date for the link, click Change, and enter a new number of days. 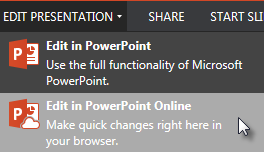 After other people make changes to a shared presentation file, PowerPoint Online notifies you when you re-open the file. A small banner near the top right corner of the window tells you who has made changes to your presentation while you were away. For Office 365 business subscribers who use SharePoint Online, PowerPoint Online automatically keeps track of changes made in online documents. When you re-open a changed presentation (or are in a file being actively edited by someone else), changed slides are highlighted in turquoise in the thumbnail pane. 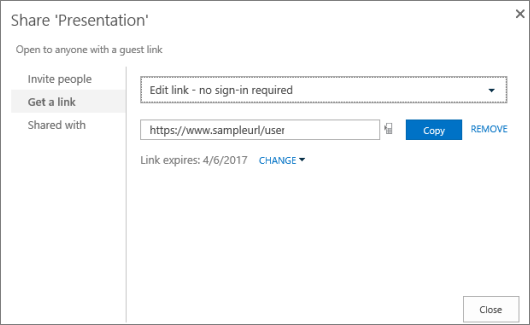 This feature works on shared documents stored in OneDrive for Business and SharePoint Online. Data about the read/unread status of individual slides is stored in an online Microsoft service designed to save user settings. The data is updated each time someone opens PowerPoint slides, and there is a limit on how many recent files are stored in the online service. If a person has turned on privacy options for a document in the Trust Center, then no edit changes in that document, by any person, are stored. Therefore there would be no turquoise highlighting in the file. The Trust Center isn't available in PowerPoint Online, but PowerPoint Online adheres to any Trust Center settings you have made in a desktop version of PowerPoint. In OneDrive, click to open the file that you want to work on with others. 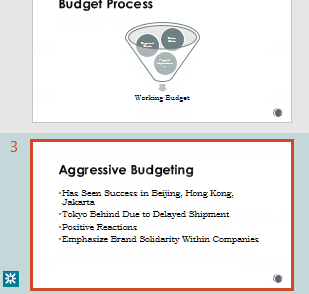 Under Edit Presentation, click Edit in PowerPoint Online. Begin working on your presentation. If others are working on the presentation at the same time, you’ll see a co-authoring icon and a number in the status bar that tell you how many people are working on the presentation. Click the down arrow next to the co-authoring icon to see who is working on the presentation. 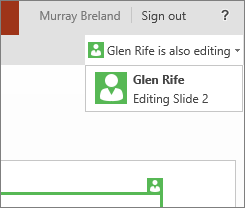 When people are editing the presentation without signing in to OneDrive or SharePoint, they show up in the list as "Guest". If they're also using PowerPoint Online, you can even see what they're typing in real-time, and an indicator that shows you what slides they're working on. You can co-author with people who use the PowerPoint desktop application. However, for best results, people using PowerPoint Online should take turns making changes with those using the PowerPoint desktop application (PowerPoint 2010 or later, or PowerPoint for Mac 2011 or later). Select a slide, or something on a slide. On the Insert tab, click Comment. Enter your comments, and press Enter. For additional comments, in the Comments pane, click New , and enter your text in the box. To reply to a comment, click in the Reply box and enter your message. 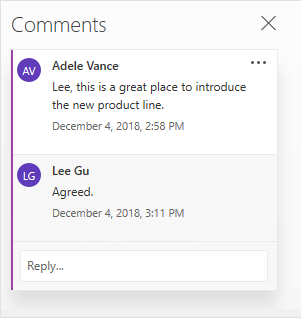 A comment bubble appears next to the item you comment about on the slide. You can rename a file in PowerPoint Online while you're co-authoring with others. Click the file name in the center of the title bar of PowerPoint Online near the top of the browser window. The entire name is selected. Type a new name for the file. Or use the arrow keys to position the insertion point within the title, and then type your changes to the file name. Press Enter when you're done. In a moment, the name change syncs with other instances of the file that are currently open.